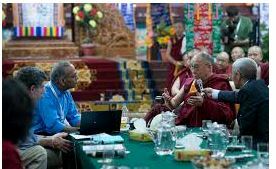 STORY: Tibetan spiritual leader, the Dalai Lama on Monday (March 12) emphasized on the convergence of scientific findings and spiritual teachings for good emotional health in India’s northern hilly town of Dharamsala. The Lama was speaking in the inaugural session of the 33rd Mind and Life conference, a four-day program organised by a local trust. The conference was based on the theme of secular ethics with over 200 scientists, scholars, and thinkers participating from different parts of the world. Many time(s) scientific finding alone (is) not sufficient in terms of emotions, like how to tackle things, said the Dalai Lama. Exiled Tibetan spiritual leader the Dalai Lama has lived in the country since fleeing a failed uprising against Chinese rule in his homeland in 1959. India is home to almost 100,000 such exiled Tibetans.